Ferdinand Wellerding was one of my husband's 4x great-grandfather through his paternal grandmother's line. According to the stone, he was 'aus Steinfeld großhersogtum Oldenburg,' which translates to 'from Steinfeld, Grand Duchy of Oldenburg.' He died on July 11, 1849 at the age of 48 years and 4 months, which indicates that he was born around March 1801. He is buried in St. Augustine's Catholic Cemetery in Minster, Ohio. I realize how lucky I am to have a stone that actually says where this immigrant ancestor was from. But, other than this, I don't have any other documentation on Ferdinand himself - no records from the Old County, no ship manifest, no census records. 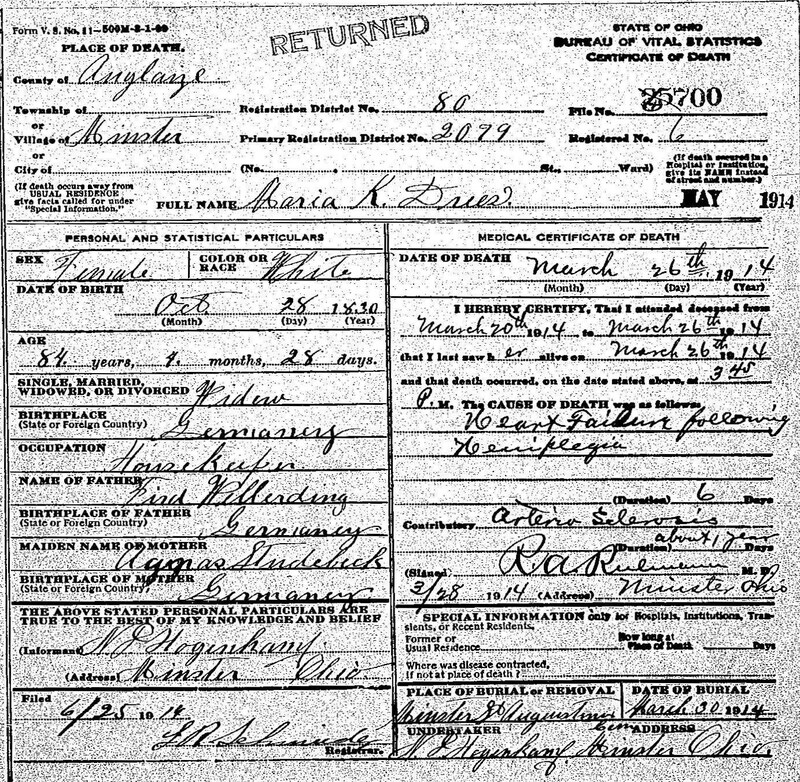 Luckily, I do have his daughter's 1914 death certificate in which he is listed as her father, AND her obituary, which tells me more about when and how the family immigrated. Ferdinand, his wife Agnes, and their two children, Maria Katherina and an unnamed brother sailed for America around 1847-1848. They landed in New Orleans. From there, they traveled to Cincinnati before ultimately settling farther north in Auglaize County, Ohio. Unfortunately, according to obituary, Ferdinand and his son died in an 1849 cholera epidemic, while Agnes lived until 1866. Knowing this family's port of entry, I now will be able to begin to comb through New Orleans immigrant ship manifests from the 1847-1848 time period. And when I decide to try to find birth and/or marriage records for Ferdinand and Agnes, I have a pretty good hint as to where geographically to start looking. What an interesting post, as my ex-husband's family heartens from the Cincinnati area. I've been trying to trace that line for our son. Would like to share Wellerding information. My relatives were from the Cincinnati area. My oldest grand father was William Wellerding married a Gertrude Menke.